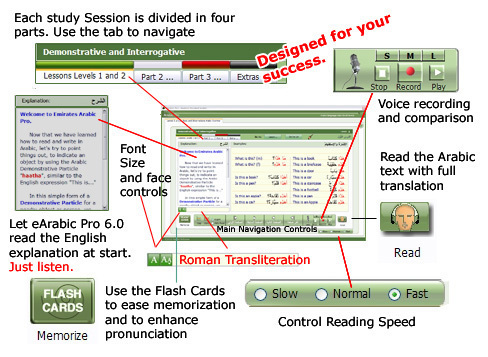 Controls in this new Arabic language tutoring program are bilingual, and tooltips in English are available with every move of your screen cursor. The interface also features Arabic-English menus, interaction, audio, instructions, text, navigation, prompts, etc... You name it. It's everything you asked for. Now it is your turn to prove to yourself your ability to learn and maintain knowledge and to use it properly.